Dortmund - Borussia Dortmund maintained their solid upward curve on the domestic front, beating Greuther Fürth 3-1 at home to make Jürgen Klopp's 250th Bundesliga game all-told as a head coach a winning one. An early brace from Polish goalgetter Robert Lewandowski and a 42nd-minute strike by Mario Götze sealed the win for the defending champions against a hard-battling Fürth side, who began well themselves before fading. The result, coupled with FC Bayern's 1-1 draw at Nuremberg, leaves BVB now „only“ nine points behind the league leaders in fourth. Fürth, now winless in ten outings, remain second from bottom on just seven points. It was action from the off at the Signal Iduna Park, Fürth keeper Max Grün warming his hands early as he dug a curled Ivan Perisic free kick out of the bottom corner with less than two minutes on the clock. A minute later Mario Götze, who had been fouled to earn that one, tricked his way past two guest defenders, rounded Grün and slipped the ball on to Lewandowski to finish the job. If Fürth were shocked by the early setback, they disguised it well. All of two minutes later, Robert Zillner marked his comeback from an extended injury lay-off with a defence-splitting pass that sent Zoltan Stieber through one-on-one with home keeper Roman Weidenfeller. The Hungarian wide midfielder kept his cool and delivered a delicate chipped finish to restore parity in double-quick time. With the Bundesliga new boys adopting the bold policy that attack is the best form of defence, both sides continued to press forward and just shy of the quarter-hour mark BVB were handed the opportunity to restore their advantage from the penalty spot when Bernd Nehrig fouled Jakub Blaszczykowski inside the box. Lewandowski did the honours with aplomb, and the champions were back in the driving seat. After that end-to-end opening, BVB began to assert their familiar dominance, pressuring the visitors into frequently giving the ball away - although Sercan Sararer did go close with a fine effort from the edge of the box half an hour in. Dortmund promptly returned to the offensive, Blaszczykowski's tight-angled finish to a ball through from Götze flashing inches wide, but they were almost caught out again in the 39th minute, Sararer this time finishing off a rapid counter-attack with a curling shot against the post. 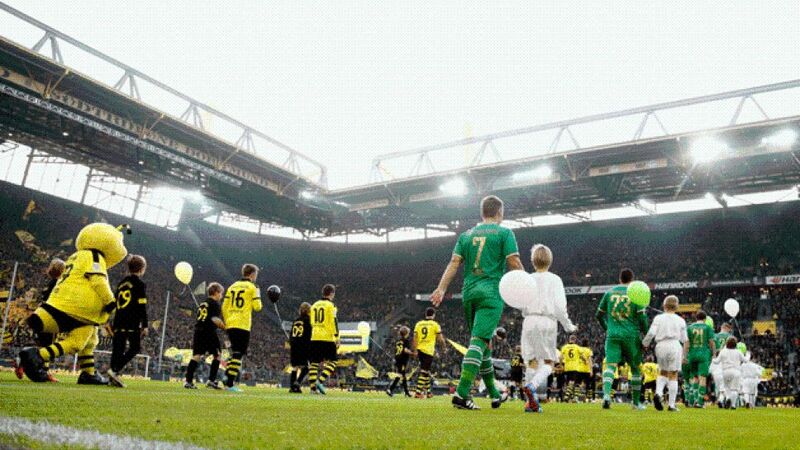 The final piece of magic of the half was reserved for the outstanding Götze however. In the 42nd minute, he latched onto an inch-perfect pass from Blaszczykowski, skipped past the onrushing Grün and the despairing Nehrig and steered the ball into the Fürth net to give BVB a two-goal cushion going into the interval. They came out after it in domineering fashion, stringing together long passing sequences which nonetheless failed to yield a chance of note until close-on the hour mark of the contest, when Blaszczykowski left three defenders in his wake before finding his master in Grün, albeit from a narrow angle. From there on in, the game took its almost inevitable course as Dortmund nursed tge result home, with Klopp's only possible complaint being that they did not add to their first-half goals total - defensive duo Hummels and Schmelzer combining well for the last of their 15 efforts with a few minutes to go.